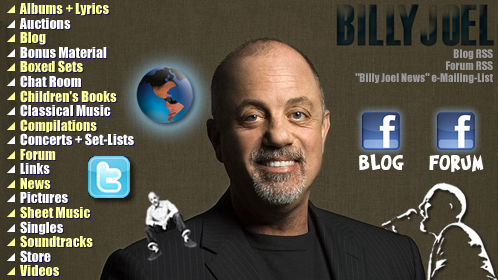 Disclaimer: This web-site is for entertainment & informational purposes only; and in no way has any direct affiliation with: Billy Joel, Columbia Records, Sony Music, Joel Songs, Inc., Maritime Music, Inc., or any other Billy Joel related entity on the internet. All of the articles in the News Section of this web-site, are reprinted without permission of the authors, and remain the property of the publications in which they originally appeared. All of the pictures in the Pictures Section of this web-site, have been provided without permission of the photographers, and remain the property of the publications in which they originally appeared.